Many triangular shawls – including our own designs – begin at the center back, with a small number of stitches, and then grow in ever-lengthening rows, which form 2 triangles, separated by a center stitch. 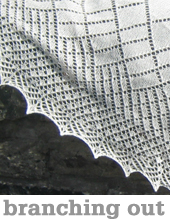 A garter-tab cast-on is recommended, as this technique creates a small rectangle of garter stitch, which blends seamlessly with the garter stitch edging which forms the top horizontal line of the shawl. It is a bit more work than just casting on stitches normally, but the results are worth the extra effort. Tutorial shown in Brooklyn Tweed Arbor in ‘alizarin’, ‘tincture’, and ‘wreath’. 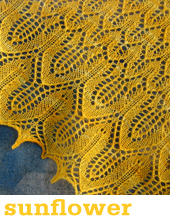 The yellow swatch above uses a regular cast on, without the garter tab. You can see how there is a gap at the top. The garter tab cast on is used to bridge that gap. The green swatch uses a regular cast-on and a garter-tab. The red swatch uses a provisional cast-on and a garter-tab. The difference between the red and green is subtle, I will outline how to do each of them below. The first step is to provisionally cast on 3 stitches. You can use this method (the crochet chain provisional cast on) or this method (the needle and hook method) to do this. Next you will unzip the provisional cast on and place the live sts on the left hand needle. Then knit those sts. All finished! Your garter tab cast on is complete. Voila!! You now have cast-on a total of 9 stitches! This method is a little fussy but comes out pretty perfect. If you haven’t picked up and knit stitches before check out our tutorial here. You can see this method comes out a teeny tiny bit less perfect at the garter tab, but it really depends on how fussy a knitter you are! For more on our simple Grain shawl check out the tutorial here. Thank you for this. It was a great tutorial. Muchas gracias. He aprendido mucho contigo. This is the best non-verbal tutorial I have ever seen for garter tab cast on’s. Thank you very much. Okay, I followed over to this post because I was interested in the current “let’s knit a simple shawl” knit-along–and I still am!–but this is even better! I’ve been avoiding the provisional cast on forever, but I think your thorough tutorial and side-by-side comparisons of the three methods (not to mention the tiny, perfectly feel-free-to-mess-up-and-start-again-without-tears samples) have convinced me to finally learn it. Thanks for lighting a fire under my scaredy-pants backside! Oh thanks! so much. I have finally just understood!! Yours is the first explanation of provisional cast-on that has made sense to me. Thank you so much for this valuable tutorial. I’m now looking forward to trying several patterns I once was afraid to attempt. Muchísimas gracias, es perfecto para el chal que quiero hacer. Thank you! I just started the Daybreak shawl and ripped it out because I knew I’d done something wrong. I’m so glad I found this! Thank you so much. This is just what I was looking for. I knew how to begin a triangular shape without the tab, and wanted a more complete way to do it. Isn’t it lovely that all of your good cheerful work is being found and used almost two years later. May there be many more. Thank you, again. I wish I had found this tutorial when I made my Ishbel. I must have ripped out 20 times. I had to cut off the end of my yarn because it was so frayed. Thanks much for a wonderful, easy to follow tutorial. Thank you so much for this tutorial!!! I tried several times to figure it out from the directions but failed miserably. I really needed the pictures to describe it. Thanks again! Thanks for the pictures and explaination. I got to “see it” to understand. I appreciate the time you put into this. Thanks so much for this great tutorial! The pictures are very clear and I am now ready to go! Beautifully illustrated garter stitch tab!! Thank-you! As a visual learner, I struggled repeatedly with the written instructions for the garter stitch tab. And then, I found your instructions and photographs. And voila,… I am finally able to get my lace project started. 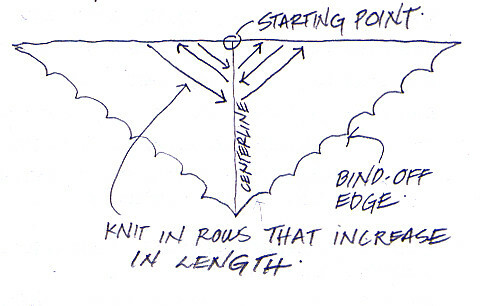 This tutorial makes sense and since I am a visual learner, I will save this and use it when I start my shawl. Thank you-this is so clear with great photos! This is a wonderful cast-on. Thank you for a photo-riffic tutorial! This is just wonderful! I’m starting my first lace shawl and was so sure I was doing things wrong. Thanks for a great tutorial with clear pictures AND written instructions. Thank you so much for the clear explanations and illustrations! Oh many thanks! I have finally just understood!! These instructions are extremely helpful! Thank you for making this tutorial. I’m wondering if you can help me with something else. I’m working on the Swallowtail shawl http://www.evelynclarkdesigns.com/pdf/Swallowtail.pdf and I have finished everything except the border, because I can not for the life of me, figure out how to start it. Could you maybe explain this or point in the direction to a tutorial? It would be greatly appreciated. Oh, bless you for this! I’ve just started a triangular shawl which starts with a provisional CO and the garter stitch tab (nice term!) but doesn’t clearly identify taking the CO out to get the last three stitches. I thought I knew what to do but your post clarified it beautifully, thanks so much! These instructions are very clear, but — using this method — will I still get the points such as on the Entomology shawl or your Photosynthesis shawl? Nancy – The Garter Tab Cast-on method is how you start your shawl – when you get to the very end of the shawl, and work the lace edging and bind-off, you are working the part of the shawl that forms the scalloped edging. So the little garter tab is almost invisible at the end, because it is in the center back of the piece of lace. It is the last few rows (at the bottom edge), and the way that you block your shawl which determine how the edge will look. 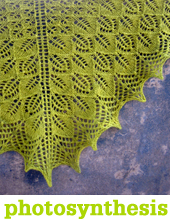 So Yes – you will still get the scalloped edge with points as you see on the Etymology or Photosynthesis shawls!